This new paperback edition includes exclusive bonus material - an all-new full chapter from Andrew's point of view during a crucial scene! I have a mixed feelings about this. Everything was perfect, up until Chapter 28. After that ? Not so much. Andrew and Camryn is a great duo. They make an awesome road trip partner. Their witty banters are so really good I'm impressed. Somehow I have this one tiny voice in the back of my head saying 'No, this cant be it. Andrew is a little bit too perfect for his own good'. I mean, hes nice, considerate, funny, witty, charming, gorgeous, thoughtful, protective, he throws a good punch, he sings, he plays guitars, hes good in bed and the list goes on. LOL SERIOUSLY?! Thats too much even for a fictional character. It doesnt even make sense ! When I discovered that this book revolves around Andrew and Camryn's road trip, I was ecstatic. I LOVE ROAD TRIPS SO MUCH. But sadly enough, this one doesn't satisfy me. Dont take it wrong. Its good, but i've read better. And the better one has set the bar too high so its pretty tough to compete. What really pissed me off is that starting from chapter 29 onwards, EVERYTHING IS TOO FREAKING CHEESY I CANT EVEN STAND IT. I MEAN IT. EVERYTHING. Too much 'baby' in one page sometimes. Its just, urgh. I cant stand cheesy and sappy lines, honest to God. I can just puke. AND WORSE, THEIR BANTERS DECREASES OKAY. THE BEST PART IN THIS BOOK WAS DECREASED TO MAKE WAY FOR THOSE CHEESY LOVE LINES. WHAT EVEN ?! The ending, if it isnt for the excessive cheesy lines and endearment words, would be good and unexpected for me. The book, as in overall too, would get a full on 5 stars from me. But the cheesy love lines, excessive usage of endearment terms, too-perfect Andrew and the slowly decreasing witty banters ruin it for me. Sorry, Redmerski. I know its got a sequel, The Edge of Always if I'm not mistaken. But I think I'm going to leave it at that. 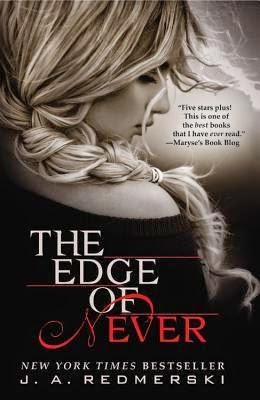 The ending for The Edge of Never is satisfying enough, there shouldn't even be a book two in the first place, in my opinion. Do I like it ? If you dont mind cheesy and sappy love lines, then I think youre going to love this.